The federal government plans to spend billions of dollars protecting New York City and the surrounding areas from rising sea levels and storms like Hurricane Sandy, and some of the most innovative projects that it'll be funding were just announced yesterday. 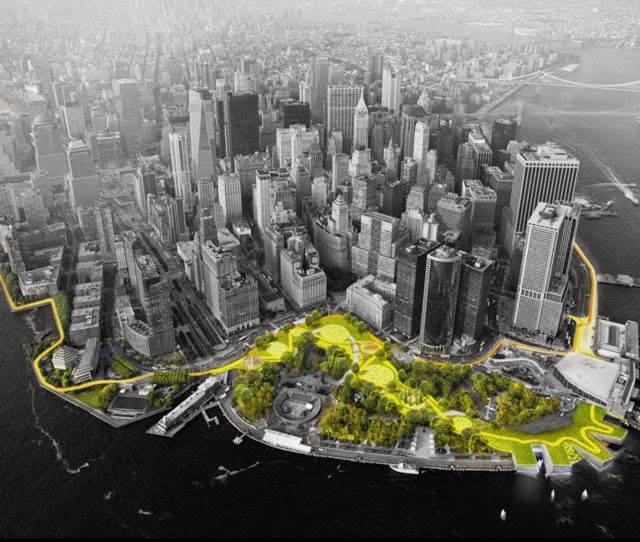 Among them are plans to construct parks and paths wrapping around lower Manhattan that include elevated areas and flood barriers that can flip into position when necessary. Another project aims to slow the waves and stabilize the city's beaches by placing breakwaters around Staten Island. The breakwaters wouldn't simply be barriers for the waves though: they'll be designed as habitats for marine life, providing protection for finfish, shellfish, and lobsters. Other plans have been chosen to protect nearby Jersey City, Hoboken, and Weehawken using pumps to remove water. These aren't the plans that are meant to provide thorough protection against a storm, however. Instead, these are the result of a competition sponsored by the US Department of Housing and Urban Development, called Rebuild By Design, and is meant to find new models for combating the effects of storms that may be useful elsewhere in the US. "These [breakwater] oyster beds that you heard about, FEMA is watching this project very closely, thinking about not just whether it can be repeated throughout the region, but in Florida and many other places that are susceptible," Housing and Urban Development secretary Shaun Donovan said yesterday. Donovan said that the projects might also receive funding from insurance providers, which could see lower costs because of their protections. "So the models that we're talking about here were specifically designed to be replicable," he said, "to bring not just more government funding, but to bring private sector funding as well." 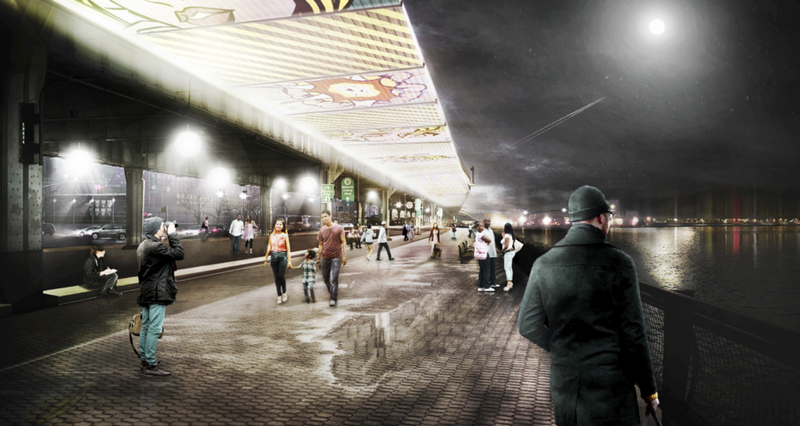 New York Mayor Bill de Blasio said that the projects will begin to take shape over the next few years. "I think you're going to see over four or five years a hugely different physical reality in this city," he said. Entrants in the design competition have, of course, created mockups of what their projects will look like around the city. Several of those visuals can be found below.